Here’s a little book of essays written by graduates of Berkeley High School, which has a truly diverse student population and moves through about 700 seniors every year. (“As you will see from these stories, some live on their own, while others come from well-off families,” states the foreword.) And they all found compelling stories to tell about themselves. The essays, which targeted mostly California state schools, UCs and select private colleges across the country, were collected for this book by a savvy college counselor there named Ilene Abrams. The book includes the name of the authors of each essay, along with what year they graduated and where they ended up going to college. It’s clear that these students were well-counseled in the process, since almost all the essays met the goal of their advisors: to tell a story “only you can tell.” The stories are rich in details, as diverse in topic, style and tone as their writers, and most tell some type of story. The best thing is that I believe they can help students see that they could write a similar essay! In case you can’t read the title in the image: The Berkeley Book of College Essays: Personal Statements for California Universities and Other Selective Schools, compiled by Janet Huseby. 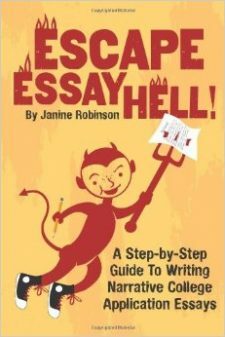 And I have to mention my own collection of stand out college application essays: Heavenly Essays.